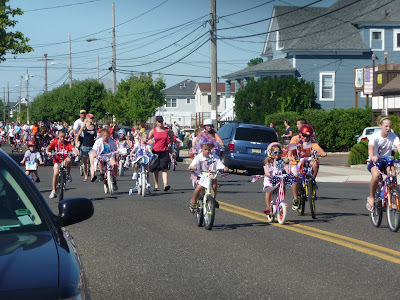 If you have the urge to craze up your bike with red white and blue then head for the nearest old fashioned bike parade. Or start one up on your own with your friends, it's safer than blasting M80's. Experience "the good-old days" as Fonthill re-creates an early 20th century July Fourth Celebration. Festivities include a decorated bike parade, town ball (19th-century baseball), watermelon eating contests, free old-time games, picnic foods and live music. For more information, call 215-348-9461 . Note that pre-registration to participate in the parade is closed but parade officials will have a hard time turning you away if you show up early with a dry good to donate to the West Chester Food Cupboard and the Coatesville Veterans Affairs Medical Center. All participants must be on the riverbank not later than 9:30 a.m. prepared to march in the parade. Baptist Home Driveway, 303 Bank Ave. Participants entering the bike parade should check in 8:30 a.m.
Two bike parades will be held at 10 a.m. The South Ocean City Parade will begin at 40th and Asbury Avenue. The Ocean City Gardens Civic Association Bike Parade will start at the end of Longport Bridge at East Newcastle Road and Gardens Parkway. Registration for both events starts 9 a.m.
1 - Slow Bike Races - a challenge of a different sort. Starting immediately after the foot races, the object of the Slow Bike Race is to ride the provided bike through the fixed course in the slowest amount of time – without any part of your body touching the ground. Sound easy? It’s harder than you think. Prizes and trophies will go to the slowest three finishers. 2 - Decorated Bike Contest - Dress up your bike, scooter or baby stroller for a chance to score a trophy for best decorated, most colorful or most original design. The contest takes place from 9 a.m. to 10 a.m. in the 81st Street and Second Avenue parking lot.